"Take me to the Promised Land"
Oh "and dying to me don't sound like all that much fun." 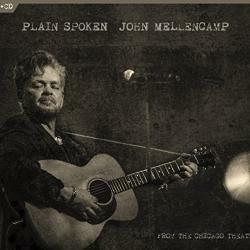 A unique voyage into the mind and music of John Mellencamp, Plain Spoken is a live concert filmed at the historic Chicago Theatre, overlaid with personal commentary from the man himself reflecting on his career and life. This DVD set not only includes the original version of the film that debuted on Netflix, but a “non-commentary” version of the concert, as well as a live CD. The set list traverses material from across John Mellencamp’s career, from classics like “Small Town” and “Pop Singer” to songs from his most recent release Sad Clowns and Hillbillies.